This is a live recording of a concert I did at the annual meeting of the Wisconsin Conference of the United Church of Christ in 1991. 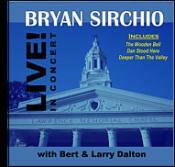 The concert took place in the beautiful chapel at Lawrence University in Appleton, WI on June 18, 1991. I was accompanied by Bert Dalton on piano and his brother Larry Dalton on stand up acoustic bass. They are amazingly talented musicians and their artistry literally transformed a number of my songs. This live recording also features some of the stories I tell when I set up songs in concerts, but each story is on it's own track so you can easily skip them after you've heard them once or twice and get right to the next song. Recorded, mixed, and mastered by Tom Blain of Ultimate Audio, Evansville, WI.